She is a 15-pound snowball of a French bulldog. The pooch has the face of a tough guy and the personality of a princess. Her owner is U.S. Rep. Jeff Denham of California. They take the occasional coast-to-coast plane ride together. But when he tried to take her on Amtrak a couple years back, he learned that only service dogs were allowed aboard. It's a policy he's been trying to change. And he appears to be gaining momentum. Denham is a Republican who chairs a House subcommittee. It oversees the agencies that regulate the nation's railroad industry. Denham believes allowing people to bring small dogs and cats with them in pet carriers would encourage more people to travel by train. It might also bring much needed revenue. Amtrak is a business that relies on taxpayer support to survive. So far, Denham has succeeded in persuading Amtrak to conduct a test run for pets in Illinois. About 145 passengers took advantage of the new service along two routes last year. Participation gradually increased each month. Now, Denham wants to expand the service nationally. 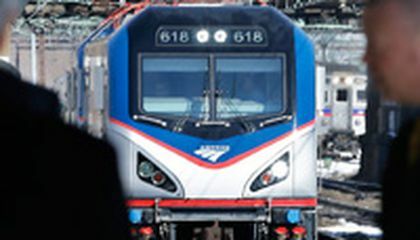 He has filed a bill that would require Amtrak to come up with a pet policy for passengers traveling less than 750 miles. Amtrak could change the policy on its own. Officials have made clear they support the concept. But they're also still in the monitoring phase. For example, one of the questions that will have to be resolved is the limit on distance that passengers with pets can travel. After all, dogs and cats need potty breaks too. "We're going at this carefully, because there are people who very much want this. And there are people who are concerned about how it could affect them," said Marc Magliari, a spokesman for Amtrak. In Illinois, those wishing to take pets must make advanced reservations and pay a $25 surcharge. Only animals weighing 20 pounds or less can board. They must be in their carriers at all times. The pets and their owners also are relegated to a particular train car. Customers have to arrive at least 30 minutes before departure so they can sign a release agreement. Amtrak reserves the right to remove from the train any pet that smells bad or is disruptive. "The experiment has gone well. The lack of any negative feedback from customers or crewmembers is heartening," Magliari said. At one point, Amtrak did allow small pets on its trains. But the animals were going into dated baggage cars with poor ventilation and poor protection from the elements. The practice was halted in the 1970s. "Millions of American families have beloved pets, and allowing them to travel by train will support the human-animal bond," said Wayne Pacelle, president and CEO of The Humane Society of the United States. At Union Station in Washington, which is Amtrak's second-busiest hub, Tracy and Samm McMillan of Fairfield, Connecticut, said they would definitely take their cockapoo, Bailey, on trips with them if they could. "We miss her. It's tough. We work. We're gone during the week, and on the weekend, we don't necessarily like leaving her, so to be able to bring her would be awesome," Samm McMillan said. "We would have brought him today for sure," Mileson said. Critical thinking challenge: Pet owners will benefit if they are allowed to bring their pets on trains. But how would Amtrak benefit? I think that if you want an animal to come onto a train with you, it should happen. If a person wants their pet on a train and then does not get to go on the train, the train would not get as much money because they would be losing passengers due to the rule that pets are not allowed. If the trains just charged a little more money and have a pets section on the trains, there would be a solution and everyone could bring their pets onboard. If someone has an allergy then there should be a specific section on the train for those people. 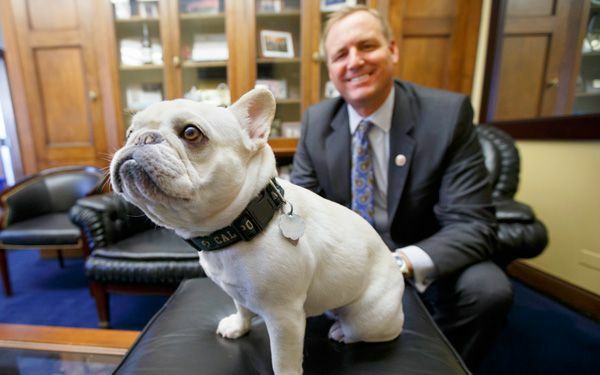 I think Jeff Denham made a very smart move by pushing to let pets be on the Amtrak. If pets can be allowed on airplanes than it should definitely be allowed to be on the Amtrak and on Trains. Many powerful people are putting in Input about what they think. So many people have beloved pets including myself so I think that pets should definitely be allowed. Personally, I think that pets should be able to ride trains, so Amtrak should keep this new policy. First, it benefits Amtrak and the people for a few reasons. It benefits the people because if they happen to have their small dog with them, they can travel for at least 750 miles, which, in my opinion, is a long travel. It benefits Amtrak because they get less complaints from people about this issue and they get more support from organizations like the Humane Society of the United States. It is also right to keep this new policy because it makes the pets happy, and I think that pets have feelings too. In conclusion, this new policy by Amtrak to let pets aboard is the right thing to do. I don't think Pets should be allowed on trains for over three hours. Transportation is Stimulating towards animals In general. Animals in trains are usually put in the cargo hold if they are too big and in different altitudes the pressure might affect the animal, the Cargo hold is not pressurized, but in the actual cabin / where the people are put. Animals are not all used to being held in a High speeds situation and that can put some small animals in shock because they are scared. The Amtrak would benifit from pet owners being able to bring their pets on trains, because Amtrak would have more riders coming to ride the train, and more money to fix the system if needed. I am a dog lover but, I don't ride the train as much. Even if I did, my dog would be over the weight limit. If the Amtrack company made special train car for pets to roam around with food, good ventilation, and a bathroom for them, they would make millions. Think about this Amtrack. It would make sense that people would be able to go on a train with a pet but if the pet has done something wrong then the owner would have to pay a fee. What they are doing here is probably very annoying to a pet owner. People should be able to have a chance to show there pets are able to go on a train. Right now there is no chance the pet can't come with them or they will have to go into storage which is very mean to the pet. So, people should be able to have the wright to bring pets on trains.